Brandenburg is one of the sixteen federal-states of Germany. The capital city of the state is Potsdam. Brandenburg surrounds but does not include the national capital and city-state Berlin. Brandenburg is bordered by Mecklenburg-Vorpommern in the north, Poland in the east, Sachsen in the south, Saxony-Anhalt in the west and Lower Saxony in the northwest. The Oder River forms a part of the eastern border, the Elbe River a portion of the western border. The main rivers in the state itself are the Spree and the Havel. In the southeast, there is a wetlands region called the Spreewald. Brandenburg is divided into 14 rural districts (Landkreise) and 4 urban districts (Kreisfreie Städte): Brandenburg an der Havel, Cottbus, Frankfurt (Oder) and Potsdam. Brandenburg has a rich and diverse history, thus creating a vast cultural value over time. From the days of the Holy Roman Empire in the late medieval and early modern times to the “birthplace” of the German Empire, being the first unified German State. Brandenburg’s architecture is as vast and as diverse as its history. One of the architectural currents that left a permanent mark on Brandenburg is the Baroque style immortalized by buildings such as the Dragon House, the Marmorpalais, the New Palace, the Potsdam City Palace and Garrison Church in Potsdam. There are over 370 museums in Brandenburg. The most noticeable museums are the royal Prussian residences around Berlin and Brandenburg like Sanssouci Castle, Rheinsberg Palace and Cecilienhof Palace. One special museum is the Potsdam Film museum, the oldest film museum in Germany, offering the unique experience of traveling through time and living the history of the German film and of the Babelsberger Film studios. Theaters and operas in Brandenburg benefit from large attendance. Noticeable theaters in Brandenburg are the Staatstheater Cottbus, the Friedrich-Wolf-Theater in Eisenhuttenstadt, the Neue Buhne in Senftenberg and the Theater in Potsdam. Cooking in Brandenburg is down-to-earth and simple. The potato is the most important side dish and ingredient. It was introduced to the region by Friedrich the Great from Prussia. Today, many Brandenburg specialties are based on the potato. Other important vegetables include asparagus, kale, beans, and beets. The local forests provide chanterelle, chestnuts, and porcini mushrooms. Given the amount of lakes and rivers in the state, seafood plays an important role. The favorites include crayfish, pike, walleye, eel, lamprey, and carp. Within Brandenburg, the "green" movement has spread into the cuisine. Many cooks choose to use only locally grown and produced foods. 80% of the meats, fish, vegetables, potatoes, and fruits consumed here are grown locally. A traditional side dish from Brandenburg is the Potato Pancake. With 4000 male and female scientists working the Potsdam area, Brandenburg has the highest density of scientific facilities in Germany in comparison to its population. Over 7 000 people work in some 250 scientific teams in the field of life sciences. The focal points of scientific activity in the region are biomedicine, bioinformatics and plant biotechnology. Given this unique density of scientific facilities in Germany, the region around the capital is a very popular location for biotechnology companies, such as: Katz Biotech AG, Thermo Fisher Scientific, Biotechnologie-Kempe GmbH, Revotar Biopharmaceuticals AG, Bioline GmbH, Aristotech Implant Technologies GmbH. With its natural assets and its historical and cultural sights, Brandenburg has much to offer tourists. The traditional tourist destinations are the Spreewald, Ruppiner Seenlandschaft (Ruppin lakes) and the Oderbruch. In 2003, approximately 3 million visitors recorded a total of 8.5 million overnight stays in establishments providing accommodation in Brandenburg (with at least nine guest beds). Foreign visitors made up 6% of this total. Besides the natural assets of Brandenburg’s tourist attractions, the city of Potsdam houses some of the lands greatest tourist attractions. Potsdam was historically a center of European immigration. Its religious tolerance attracted people from France, Russia, the Netherlands and Bohemia. This is still visible in the culture and architecture of the city. The New Palace (Neues Palais), built between 1763 and 1769 to celebrate the end of the Seven Years' War, in which Prussia ousted Austria from its centuries-long role as the dominant power in German affairs. It is a much larger and grander palace than Sanssouci, having over 200 rooms and 400 statues as decoration. It served as a guest house for numerous royal visitors. It is now housing parts of University of Potsdam. The Roman Baths (Römische Bäder), built by Karl Friedrich Schinkel and Ludwig Persius in 1829-1840. It is a complex of buildings including a tea pavilion, a Renaissance-style villa, and a Roman bathhouse (from which the whole complex takes its name). The Chinese Tea House (Chinesisches Teehaus), an 18th century pavilion built in a Chinese style, the fashion of the time. Three gates from the original city wall remain today. The oldest is the Hunters' Gate (Jägertor), built in 1733. 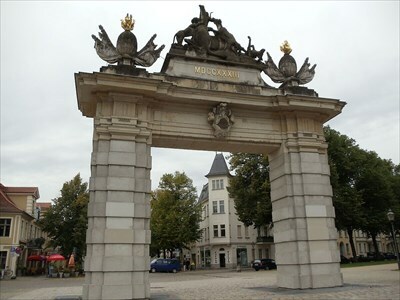 The Nauener Tor was built in 1755 and close to the historic DutchQuarter. The ornate Brandenburg Gate (built in 1770, not to be confused with the Brandenburg Gate in Berlin) is situated on the Luisenplatz at the western entrance to the old town. The Old Market Square (Alter Markt) is Potsdam's historical city centre. For three centuries this was the site of the City Palace (Stadtschloß), a royal palace built in 1662. Under Frederick the Great, the palace became the winter residence of the Prussian kings. The Old Market Square is dominated today by the dome of St. Nicholas' Church (Nikolaikirche), built in 1837 in the classical style. It was the last work of Karl Friedrich Schinkel, who designed the building but did not live to see its completion. It was finished by his disciples Friedrich August Stüler and Ludwig Persius. The eastern side of the Market Square is dominated by the Old City Hall (Altes Rathaus), built in 1755 by the Dutch architect Jan Bouman (1706–1776). It has a characteristic circular tower, crowned with a gilded Atlas bearing the world on his shoulders. North of the Old Market Square is the oval French Church (Französische Kirche), erected in the 1750s by Boumann for the Huguenot community. Another landmark of Potsdam is the two-street Dutch Quarter (Holländisches Viertel), an ensemble of buildings that is unique in Europe, with about 150 houses built of red bricks in the Dutch style. It was built between 1734 and 1742 under the direction of Jan Bouman to be used by Dutch artisans and craftsmen who had been invited to settle here by King Frederick Wilhelm I. Today, this area is one of Potsdam's most visited districts. North of the city center is the Russian colony of Alexandrowka, a small enclave of Russian architecture (including an Orthodox chapel) built in 1825 for a group of Russian immigrants. Since 1999, the colony has been a UNESCO World Heritage Site. East of the Alexandrowka colony is a large park, the New Garden (Neuer Garten), which was laid out from 1786 in the English style. The site contains two palaces; one of them, the Cecilienhof, was where the Potsdam Conference was held in July and August 1945. The Marmorpalais (Marble Palace) was built in 1789 in the style of classicism. Nearby is the Biosphäre Potsdam, a tropical botanical garden. There are many parks in Potsdam, most of them included in UNESCO World Heritage Sites. Besides the historical monuments and UNESCO World Heritage Sites, Brandenburg is also home to Europes biggest tropical holiday world! The Rainforest, with around 50,000 plants and 600 different species, including some rare plants. The Tropical Sea, a 140 metres pool with an area of 4,400 square metres and a depth of 1.35 metres designed to look like the waters of a coral island, a 200 metres sandy beach and 850 wooden sun-loungers; water temperature 28 °C. The Bali Lagoon, with an area of 1,200 square metres and a depth of less than 1 metre in places, fountains, a current canal, whirlpools and two water slides; water temperature 32 °C.